Right Worshipful F. Brian Emery of South Weymouth is the appointment of Grand Master Fred Kirby Bauer as the Deputy Grand Master. A Past Master of Old Colony Lodge of Hingham, he has been the Grand Sword Bearer for the past three years. A native of New Brunswick, Canada, where he majored in business administration at the New Brunswick Institute of Technology, Brother Emery came to Boston in the mid-1970s to join his brother. Larry, as distributors of overhead garage doors. They now operate the Overhead Door Company of Boston. It was Worshipful Larry Emery who introduced Freemasonry to his brother, Brian. Worshipful Brother Larry was presiding in the East of Old Colony Lodge and raised his Brother in 1980. 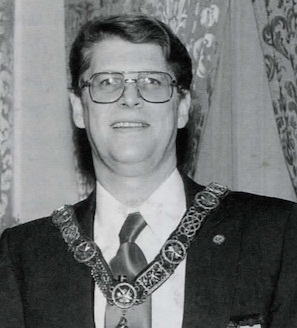 It didn't take Brian long to get started and in 1990 be was seated as Master of Old Colony Lodge. He has been a Trustee since 1992 and in the same year served as District Deputy Grand Marshal for Right Worshipful Richard G. Weston of the Plymouth 27th Masonic District. Brother Weston is now Brother Emery's aide as the Grand Standard Bearer. Deputy Grand Master Brian Emery and his wife, Sharon, are parents of daughters Tricia and Amanda, both Past Worthy Advisors of Hingham Rainbow Assembly No. 76. Amanda was Grand Representative to Arizona in 1997. Brother Emery served as advisor to the assembly and was awarded the Grand Cross of Color. The couple's newest interest is in grandson Joshua. In South Weymouth the Emery family attends Old South Union Church where he has served as a trustee. His varied interests include genealogy, photography, bowling, tennis and golf and traveling throughout his new country. He has been a certified instructor for the Lodge of Instruction and in 1997 was honored with the presentation of the Joseph Warren Medal. His Scottish Rite affiliation is in the Valley of Boston. He is Master of Ceremonies in Massachusetts Consistory. His York Rite affiliations are with St. Andrews Royal Arch Chapter, Boston Council of Royal and Select Masters and St. Bernard Commandery No. 12. He is a member of Aleppo Shrine Temple and Taleb Grotto of Quincy where he will be Monarch this year. Brother Emery is a graduate of the Pioneer Class of the Masonic Leadership Institute. Most Worshipful Grand Master, Grand Lodge Officers, Distinguished Guests and Brethren all. It is with a great amount of pride, honor, and humility that I stand here as your Deputy Grand Master. I thank you for the opportunity to serve and promise I will do my utmost to fulfill my obligation. Today we have installed our Grand Master who will lead our World Class Fraternity into the next millennium. As a fraternity, we must reflect upon our past to review our successes so that we can plan for our future. Each of us in our Masonic careers has our own priorities, our own goals, our own needs, our own plans to carry us into the future. Grand Lodge priorities certainly are not always the same as each of yours. As some of you have district commitments, others have lodge agendas, and still others are involved in associated bodies at many differing levels. But our present and future performance must be together. Our commitment has to be to each other. Let us take a look at some recent programs and events that have been sponsored by our fraternity. Freemasonry has always prided itself on its benevolence, and since the beginning of the Masonic Home in the early 1900's at Charlton, we have always promoted service to our aging. If we can look at this facility as only one example of what we do for our elderly, we must be very proud of our accomplishments. Most of us have attended the Home for a Grand Master's Fair, a dedication of one of the beautiful stained glass windows, or with your Lodge, just to visit one of your members. Now, with the completion of the most recent construction, we must realize that not only do the residents benefit but the whole Fraternity benefits as we utilize this magnificent edifice for all types of Masonic events. Another program the Grand Lodge has initiated is a scholarship program for sons and daughters of Massachusetts Masons. Since its inception in 1995 it has grown from 4 scholarships - to this past year 29 - S5000 scholarships having been awarded to deserving applicants. As we know from our last quarterly meeting, more generous contributions are still being presented. We have recently sponsored one-day classes in both Grand Lodge, to initiate new members, as well as a one-day Masonic Unity class, to initiate members for Scottish Rite and Shrine Masons. These are changes in our traditional ways, but as long as our values are upheld as new ideas are presented, we must adapt so we can look to the future. The Masonic Leadership Institute of Massachusetts is another outstanding program developed in 1997, with cooperation between Grand Lodge, York Rite, Scottish Rite, and Shrine. As a graduate of the Pioneer Class in 1998, I highly recommend this program for self-development. The objective of the Institute is to train men to be leaders at their work, in their community, as well as in their Masonic lives. These are a few examples of programs that the Masons of Massachusetts have had the foresight to initiate; the perseverance to have seen the projects completed and the enduring effort over the span of time to continually adjust to the ever-changing world environment. These programs, and the willingness to accept the challenges they each presented, were born with the spirit of cooperation and brotherhood necessary for their success. There is nothing in this world that stays the same, and the survival of our organization depends on our being able to adopt the changes necessary to ensure our viability in the future. Freemasonry is an organization that is rich in tradition, and our conviction to our beliefs and obligations is outstanding. In conclusion, I challenge each of you to work together in whatever segment of our Fraternity is your primary interest. Our strength comes from our bond to one another. We must reflect upon our strength to realize that,"The Best is yet to be." Most Worshipful Grand Master, I, along with all the other appointed officers of this Grand Lodge of our Commonwealth, thank you for the opportunity to serve you as Grand Master. We pledge our support to you, that you might utilize all our skills to further build the Fraternity we love so much. Brethren, I wish to all a healthy and prosperous New Year. May God bless you. This page was last modified on 31 May 2016, at 17:52.